Builders Grade or Thermally Broken Aluminum Windows? When a builder orders new windows for his new home build, he looks for a window that will be inexpensive and will last for his one year warranty period on the house. To most of us this sounds just crazy. One Year?? Yes that's his obligation from a legal standpoint. Most builders will use a window with a five to ten year warranty on fogging of the glass units, but that does little for you if the window itself is leaking air for some reason, the spring bars break, it won't stay open, it's drafty in the winter or the heat blazes through it in the summer.. These are the ones you proobably need to rip out of your house because it really costs more just to keep them in the long run. They are about 4 times less energy efficient than a modern window. Ones from pre-2009 have no heat reflective glass what-so-ever. The energy loss is massive. Cannot meet Energy Star Requirements from the Federal Government. Do not qualify for Federal Rebates or Incentives to buy Energy Efficient Products. Can have totally clear glass or high performance Low E Glass. Can have broken seals after just a few years. For decades this was the best product for homes over 250,000 in value. Energy Star Guidelines got too low for aluminum. Thermally broken means there is a "poured and de-bridged" plastic rib in the center of the window extrusion to slow the conduction of heat and cold through the frame itself. Better window manufacturers will have this in both the main frame and the sash itself. For this product I prefer a window with no plastic at all. The biggest flaws in aluminum windows really boil down to plastic. The other big point of failure is the sash balance or the locks. Better products will have these as easily replaceable parts. The Eighties saw a lot of bronze single hung aluminum windows. Now what do we do with all of those? If you have to have bronze windows then you only have a few choices. You can go back with the thermal break aluminum instead of the builders grade unit, you can keep what you have or you can get a painted or laminated two toned vinyl replacement window. The latter is the most energy efficient solution but is a more costly one. Two toned windows will run around $150 more than a regular window. 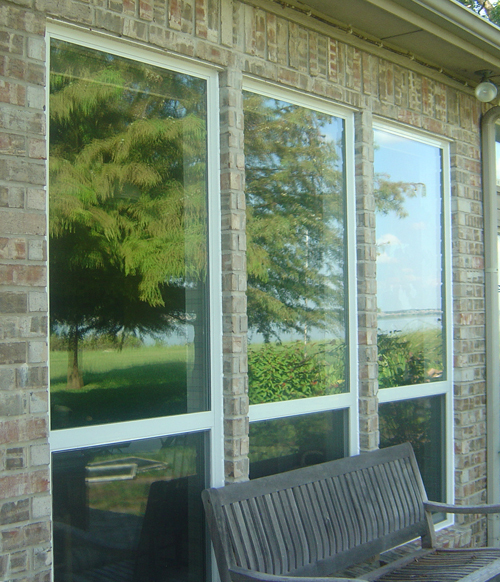 For more than 20 years the thermally broken aluminum window was the best product in high end homes. Now we use more vinyl but this was and is one of the toughest most durable, dependable, rigid windows in the world. Ours are actually approved for buildings up to 6 stories tall. Can have the smallest frame size of any operating window due to strength of aluminum. Are thinner in profile and depth than every Vinyl Window out there both Single Hung and Double Hung. Builders Grade windows are 2 3/8" thick while Thermally Broken Aluminum Windows are 2 3/4" thick. Builders grade windows are installed with nailing fins and as the home settles the window will move with the framing of the house. This can cause the window to become out of square and to leak air. These are availble in White, Tan or Beige, Bronze and in some cases Sandstone or Adobe Colored. The Difference between the cheap window and the good window. This is a cool demo of thermal break in action. In this demonstration the frame is frozen on the inside part of the plastic rib but room temperature on the other side of rib. This is the slowing of conduction. The builders grade window will have the conduction move right through the frame. This is why you see frost on some windows on really cold days and why the frames are so hot when its a burly hot Texas day. More Single Hung Aluminum things to know. The cheap windows are cheap and expensive windows are expensive. Imagine that. The cheaper windows of the 70's through the 90's have become one of the biggest energy wasters in homes across the country. All windows can be with or without grids, with or without Low E Glass and can come with some of the most amazing glass packages in the country. Doing our homework and knowing what products come from each specific window manufacturer is really important. I see these that are great and others that are just junk. The ones in almost every house in the country are all pretty much junk once they've been there a few years. This one I took great pride in ripping out and putting in a lovely patio type french door. If you look closely at the bottom of the window on the right you can see the bow in the window sill. This is allowing air infiltration both cold and hot and is costing hundreds of dollars a year on wasted energy. It is estimated that the average home has air inflitration equal to a two foot by two foot hole in the side of the home. That is a lot of air. That's a lot of wasted air conditioning and heating dollars you lose every year. Builders grade windows will have 7/16" thick glass made of single strength glass. Again, these are designed to be cheap. Certainly not the right product if you plan to live in a home for a lengthy period of time. Argon Gas isn't available in builders grade type products. The Thermal Break will have glass that's twice as thick and has Argon Gas available. Royal Windows made by NT WIndow in Mansfield has an economical model of this window, while The Don Young Company makes one that is a little more upscale. Our more economical, mid ranged type product is the NT Window Royal Series and it's made locally in South Fort Worth around Mansfield Texas. 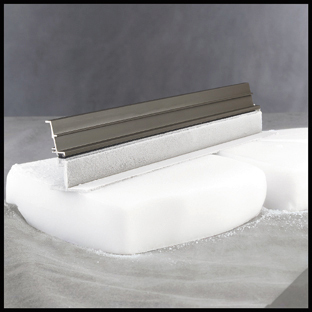 General Aluminum also has offerings that are more cost effective. This is something to stay on the cheap side of the scales but it doesn't have what I would consider a long potential lifespan. Warranty is usually 10 years on glass only not on mechanical parts. See our Google Maps Reviews by Clicking here. We have 13 Five Star Reviews and one jerky competitor trying to make me look bad! Rework of the Amazing Company About Us Page. YouTube Video is up over 35,000 Views and there are roughly 40 people a day who learn to hang windows from us!